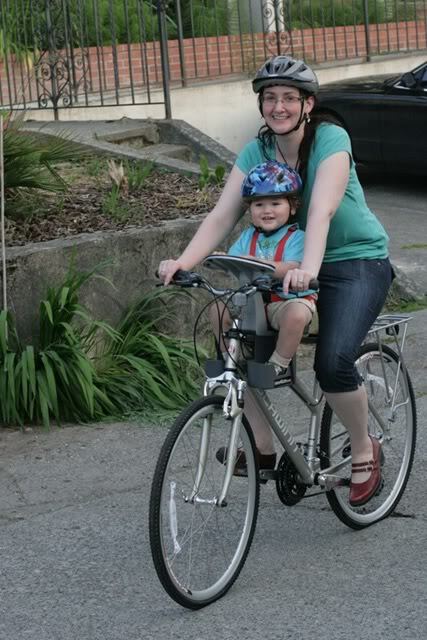 Last summer I wrote a post extolling our new bike seat, the WeeRide Kangaroo Child Bike Seat. Besides the WeeRide Kangaroo Seat , other front-mounted seats (there aren't many) include the iBert , the Discovery 101 by Swedish company Hamax, and the Pulse by Kettler Bingo Front Mounted Bicycle Child Carrier . I checked the competition out before choosing the WeeRide, and these are the reasons why I like our choice, as well as what I would change. ETA: I forgot to be clear about this, but our little guy is almost 3 years old now, and he had just turned 2 when the pictures were taken last summer. He is and was about 37 pounds and 3 feet tall so on the high end of the seat's limits. I believe the seat is intended for children over a year because the child needs to be able to sit up confidently and the neck must be strong enough to hold up a helmet for long periods. You can use your judgment about when that is. The foot rests adjust for smaller babies (shorter legs), but we have them in the position that allows for the longest legs. The weight limit is up to 40 pounds. 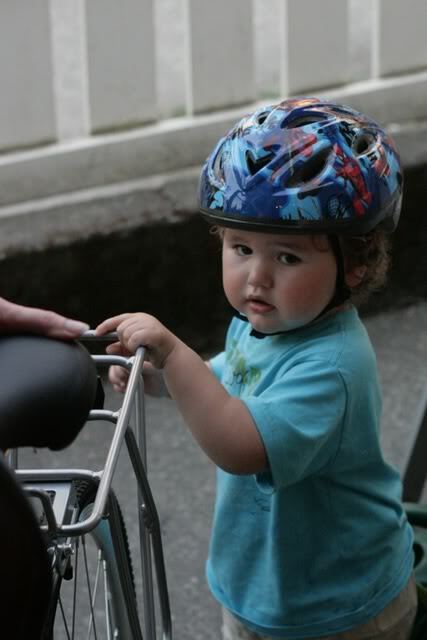 The reason we chose a front-mounted seat in general, rather than a rear-mounted seat or bike trailer, is that it allows our child to have an adult-eye view of the bike trip. I can keep an eye on him without being distracted from my biking. His weight is well positioned so it won't throw off my balance. I also felt like this type of bike riding, with my toddler centered between my arms, was the most like babywearing. It just felt right to me! A big reason we chose the WeeRide Kangaroo Child Bike Seat in particular is that it's one of the cheapest options, particularly since it's eligible for Amazon's free Super Saver Shipping . 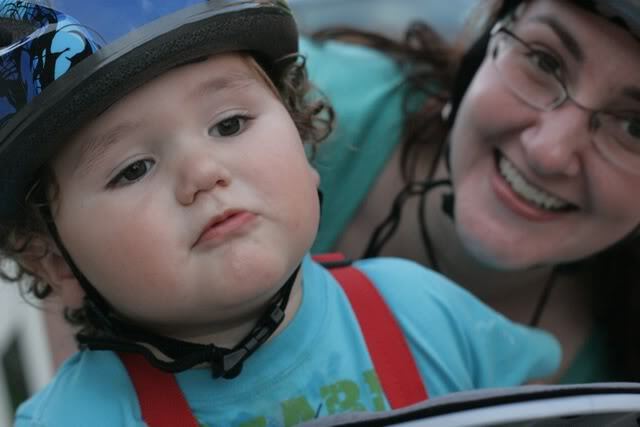 The WeeRide had the highest weight limit of the front-seated models (40 pounds), a must for our chunky monkey! The WeeRide seat is pretty comfy for the kid, with a nice back rest and somewhat longer foot supports. Since we're using it for a toddler, I appreciate that it's nice and upright so he can see what's coming ahead. There's also a deluxe padded version of the WeeRide in case you want to upgrade. There's a nicely padded handrest for your toddler's little pudgy mitts. It's been fairly easy to train Mikko to rest his hands there rather than trying to steal the handlebars from me. The WeeRide is easy to remove in a moment if the adult wants to ride alone. You keep the bar attached and just unscrew the seat itself from a big hand-operated screw. Assembling it onto my bike in the first place wasn't too challenging, either. Front-mounted seats don't work with drop handlebars, fyi, but it fits fine on my bike. I was worried that biking around the seat would be awkward, that I would be in an exaggeratedly bowlegged position, but that's not the case. I definitely have to turn my legs out a little wider than if the seat weren't there, but it's only a slight adjustment to riding normally, and I'm 5'9". Hopefully you can see the angle in the picture up top. No biggie, yes? I haven't had any problems balancing with the child's seat attached and child within, even though Mikko's a hefty 37 pounds. It helps that the seat's weight is so well centered. Everyone will smile at you when you have a cute baby in a front-mounted seat. The happiness is contagious. A con of all front-mounted seats is that they're intended for smaller babies than our guy. As I said, the WeeRide has the highest weight limit, but even so, my toddler's long legs have to fold rather sharply for him to fit his feet into the shoe rests. I wish the foot supports were even more adjustable downward to give his legs room to grow. Note that I haven't found a front-mounted seat that has more room, though; I just wish one did! This isn't so much a con as just a note. If you have multiple children or expect to, you might find a different biking configuration is more affordable or convenient. For instance, there are bike trailers that are built for two kids , or you could get a Dutch Bakfiets, which allows for multiple children. If you expect to have a toddler or preschooler along with an infant, though, I could see putting a front-mounted seat like this in front for the younger child (who is at least old enough to sit up and wear a helmet) with a rear-mounted seat behind for the older child. For even older children, there are tandem bike attachments that keep the bicycling learner safe while practicing the pedals, or of course there's always the option of having an older child ride a bike alongside you. The added 37 pounds of child weight plus the seat means that I don't go all that quickly, and hills would be a chore. Fortunately, I'm able to ride along a nice, level stretch of waterfront. I don't know if a trailer would be a lot easier or not, but presumably so, because of the benefit of added wheels. I also try to be very cautious when putting Mikko into the seat not to rely on the kickstand to hold him and the bike up but always to steady the bike myself until I get on. Toddlers will help you wheel out the bike. Expect no less. (affiliate links galore, natch), my bike and helmet at Costco, and Mikko's helmet at Walmart, I think? Amazon also has toddler bike helmets if you know what size you're looking for. We actually had to graduate Mikko to the 5-year-old version because of his unusually large skull (a family trait! ), and I'm thinking this summer he might be moving on up to the 8-year-old model. So you might want to try on helmets in person before deciding, but I couldn't find a deal on the seat anywhere that was better than on Amazon (and I did look). But, you can often find bikes and bike accessories, including various seats and trailers, for free or low cost by asking around or checking out groups like Freecycle or Craigslist for your area. Also check consignment and thrift shops. Just make sure that whatever you get is in good working order for safety's sake, and add in the essential safety gear depending on your riding habits (bike helmets for all riders for sure, plus lights and reflectors in case you're out after sunset, and a bell to warn pesky pedestrians on the bike path that you're coming through with your cuteness). But, most of all, happy trails to you and your little one! Enjoy your bicycle (re)built for two. 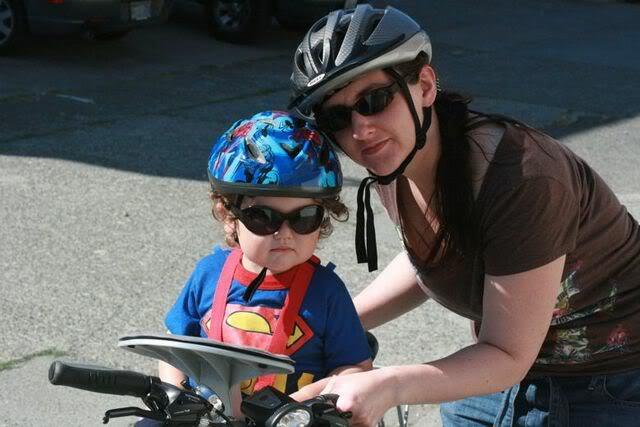 Two bike helmets are a must when bicycling with your toddler. Matching sunglasses and tough-guy glares are optional but recommended. P.S. 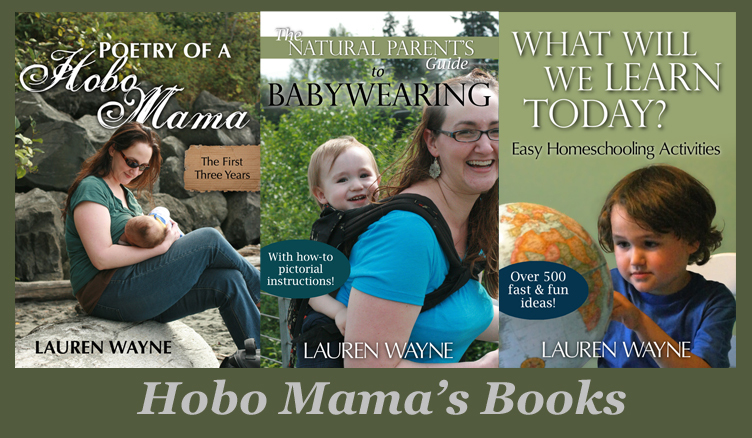 Enjoy today's coordinating Wordless Wednesday at HoboMama.com. Disclosure: I received no product or compensation for this review. Thanks for the review! 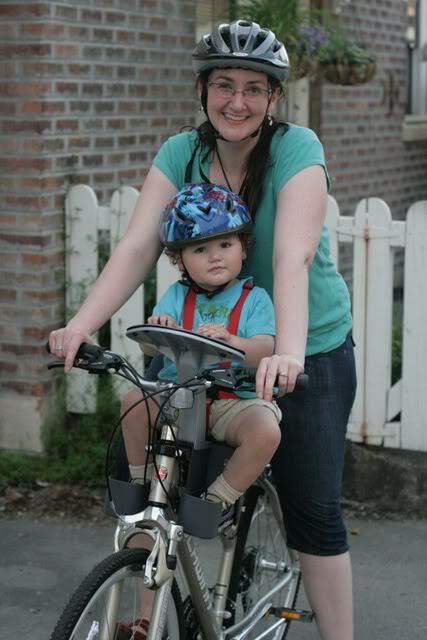 I am going to be in the market for a bicycle seat for my 24 pound toddler soon, and I like the idea of a front mount. Luckily, I think this would work for us for a long time, since my toddler's big sister weighs all of 39.5 lbs at 5 years old. Thanks so much for this great review. i'm looking at buying a WeeRide seat for my son and this is just what I need. Your little man looks very cute!